[176 Pages Report] The mobile money market size is estimated to grow from USD 21.15 Billion in 2016 to USD 112.29 Billion by 2021, at an estimated Compound Annual Growth Rate (CAGR) of 39.64% from 2016 to 2021. In the current scenario, the adoption of digital financial transaction has increased which has given a thrust to the demand of mobile money. The objectives of the report are to define, describe, and forecast the market on the basis of transaction mode, nature of payment, location, type of purchase, vertical, and region, to provide detailed information regarding the key factors influencing market growth (drivers, restraints, opportunities, and challenges), to track and analyze the market scenario on the basis of technological developments, product launches, and mergers & acquisitions and to forecast the market size of market segments with respect to five main regions, namely, North America, Europe, Asia-Pacific (APAC), the Middle East and Africa (MEA), and Latin America. The base year considered for the study is 2015 and the market size is forecast from 2016 to 2021. The mobile money market ecosystem comprises vendors, such as Vodafone Group Plc, Gemalto, FIS, Google Inc., Mastercard Incorporated, Bharti Airtel Limited, Orange S.A., Monitise Plc, Mahindra Comviva, and PayPal. Further, the report also includes key innovators such as Carta WorldWide, Strands, Western Union, and Cellum who provide mobile money services to end users to cater to their requirements and transaction needs. The mobile money market report is broadly segmented into the following transaction mode, nature of payment, location, type of purchase, vertical, and region. 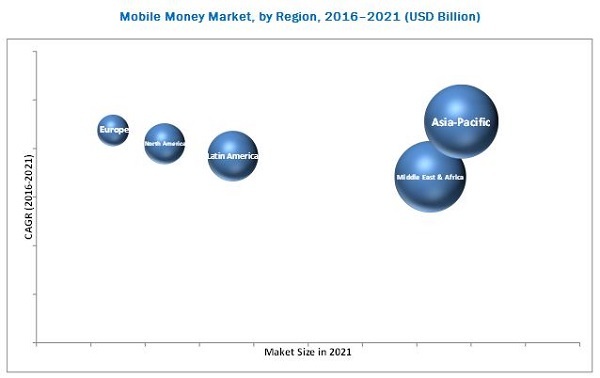 MarketsandMarkets forecasts the mobile money market size to grow from USD 21.15 Billion in 2016 to USD 112.29 Billion by 2021, at a Compound Annual Growth Rate (CAGR) of 39.64% from 2016 to 2021. Technological advancement in mobile devices, indispensable requirement to have ubiquitous access to financial solutions, rising use of non-cash payments, creation of new business avenues for stakeholders, evolving demographic needs across regions, rising use of mobile money services across businesses are some of the driving forces in the market. The scope of this report covers the mobile money market by location, type of purchase, vertical, transaction mode, nature of payment, and region. Mobile apps segment in transaction modes is expected to have the largest market share, due to its easy operability and customization facilities. Person to person segment, under nature of payments, is expected to have largest market share during the forecast period 2016–2021 as the payment services, provided by banks, offer their customers with heightened convenience, immediate withdraws and deposits, and facilitate instant money transfers through any mobile device and Mobile Network Operator (MNO). By location, remote payments dominate the mobile money market and account for the largest market share. The reason being this type of payment usually makes use of premium SMS, mobile web/WAP, STK/USSD, browser, and mobile applications and can be processed over a subscriber’s mobile phone bill, prepaid payments, and debit or credit card payments. These payments are convenient for consumers as they can be conducted through any type of mobile phone, ranging from a basic handset to smartphones. Airtime Transfer and top ups segment, under types of purchases, is expected to have the largest market share during the forecast period 2016–2021. This is due to the fact that airtime transfers are easy; users just have to select a top up amount and airtime transfer is done. The other reason is that it is safe to use and an instant way of payment. Asia-Pacific is expected to hold the largest market share as well as to grow with the highest CAGR in the mobile money market in the forecast period 2016–2021. This is because of the large-scale acceptance of mobile money services by the users along with the escalating advancements in regulations and technologies benefitting all the stakeholders present in the mobile money ecosystem in this region, along with the presence of the vast number of mobile subscribers in this region. However, prevailing data security apprehensions, interoperability among devices, and lack of content awareness about the benefits related to mobile money services act as restraining factors for the market. The major vendors in the mobile money market include Vodafone Group Plc, Gemalto, FIS, Google Inc., Mastercard Incorporated, Bharti Airtel Limited, Orange S.A., Monitise Plc, and Mahindra Comviva. These players adopted various strategies such as new product launches, partnerships, agreements, collaborations, mergers & acquisitions, and business expansions to cater to the needs of the market. The report also includes key innovators in the market, such as Carta Worlwide, Cellum, Western Union, and Strands. 14.6 Fidelity National Information Services, Inc.
15.4 Western Union Holdings, Inc.